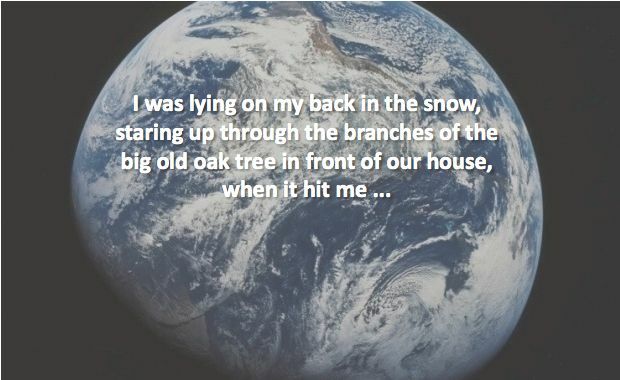 I was lying on my back in the snow, staring up through the branches of the big old oak tree in front of our house, when it hit me. That’s where I’d ended up after going down hill on my buttocks (on purpose, riding tea-saucers with my youngest daughter). It felt lovely just to lie there, looking up, knowing that beyond that beautiful mixture of blue sky and white cloud was endless deep space — and that I was one of seven billion little points of consciousness living inside this tiny, protective bubble of earth, water, and air. We humans are born with the ability to know something about our planetary situation. But not all of us have the opportunity to learn about it. And not all of us who have the opportunity to learn about it actually manage to do so. Some actively don’t want to know. Those of us who do know are quite the minority — though at least we are a growing minority. The knowledge that we are a self-aware form of life, living on a small planet, circling a normal star in a normal galaxy, protected from the dangers of the cosmos and supported in our evolution by the most intricate web of natural systems, may be the most revolutionary thought in all of human history. Among that relatively small-but-growing minority, there are also those who feel driven to actively seek out more and more information. The more they understand, the more they want to know — and the more astonished and amazed they get. And usually worried as well. Many of the really interested ones turn into scientists. Many of the really worried turn into activists. (Actually, that works both ways of course — some of the scientists are the most worried of them all.) And then there are those who have a strong desire to dive directly into the actual machinery of human civilization, somewhere, anywhere, and start fixing the things that are obviously broken, and that are leading us step-by-step in the worst of directions. Well, the more one knows, the more one wants to do. That’s the thought that hit me, lying there in the snow, looking up through the spidery tendrils of the oak-tree branches, thinking about the vastness of space beyond that blue-white wonder we call the sky. How could I have chosen any other profession? I so love learning about this planet, how it works, how unique and beautiful it is compared to everything else we can see (so far) in the universe. Books on the astonishing evolution and intricacy of nature, and books on the remarkable diversity and drive of human culture, are equally treasured in my library. Both nature and human civilization are worth striving to protect. They are both “family,” you might say, with all the special duties and obligations and pleasures that family life brings with it. Of course, understanding the extent of the dangers and disruptions that we and other living things (our family) now face — dangers created by human actions, though mostly created unconsciously — is not pleasant. I imagine it feels something like being a doctor, specializing in the care of diseases caused by smoking, or environmental pollution, or other preventable, catastrophic dangers. Knowledge of the risks we face, understanding of the scale of the challenges we must overcome, can be felt as a burden. As far as I know, there is only one “cure” for that feeling of burden that knowledge of our planetary situation can bring, and that’s action. Doing whatever one can to make a difference. Believing, and increasingly knowing, that many, many other people are doing the same kinds of things, for the same kinds of reasons, in a process of rapid change and innovation we call “transformation.” And trusting that although the hour is late and the challenges many, there are now so many shoulders pushing on that wheel of transformation that it will soon begin rolling faster and faster, until it is almost rolling of its own accord. 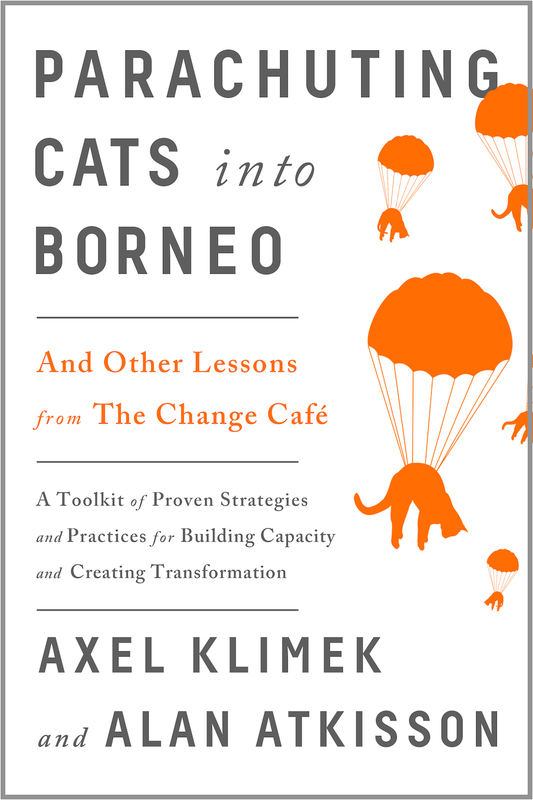 That, for me, is what means to be a sustainability change agent. “Action cures the worry.” Good point! But “the more one knows, the more one wants to do” is not correct. If the person who “knows” is self-interested, he/she will only attempt to save himself/herself by sacrifices others.